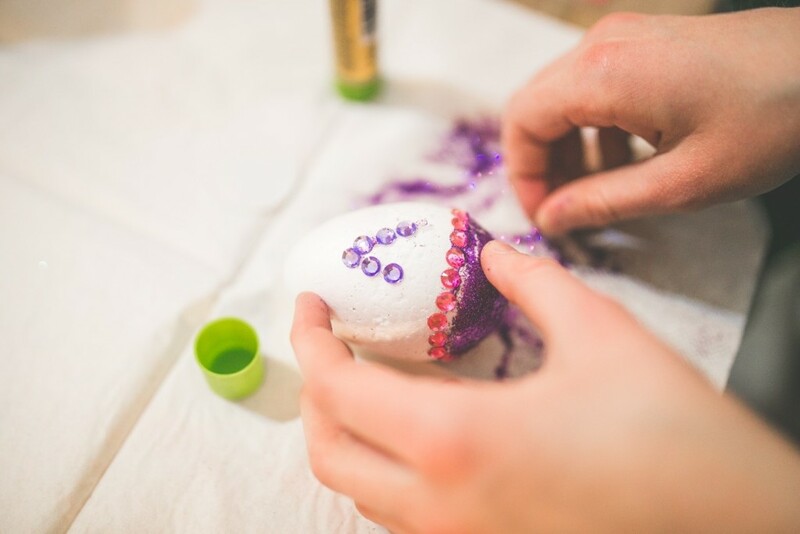 There’s nothing more fun than getting stuck into some arts and crafts with the whole family and, with the temperamentality of the English weather, you may need something to occupy the little ones over the Easter weekend if they can’t go outside. Welcome in the spirit of Easter with these fun and simple crafts that’ll bring a smile to everyone’s face and some Spring colour into the home. These eggs will be the perfect decoration for your home! This craft may need some adult supervision, but there’s no reason why your children can’t have fun creating all kinds of colourful combinations on their eggs once the tricky parts are out the way. The first step of this craft is to hollow out the egg, a simple process which involves creating two small holes in the egg at the top and bottom with a pin – the one at the bottom should be a little bigger – before blowing through the smaller hole and emptying the egg. Real eggs can always be substituted for polystyrene eggs from a craft shop if you think real eggs would be too fragile. Once washed, these eggs are the perfect canvas for all kinds of creative flair. You can use any materials from paint and ink to glitter, sequins and gems to make a masterpiece. For a simpler and maybe less messy craft, buy paper napkins with a pretty pattern, paint the egg with glue, cover the egg with the thin part of the napkin which includes the design, and let it dry before varnishing with more glue. Find more inspiration here. 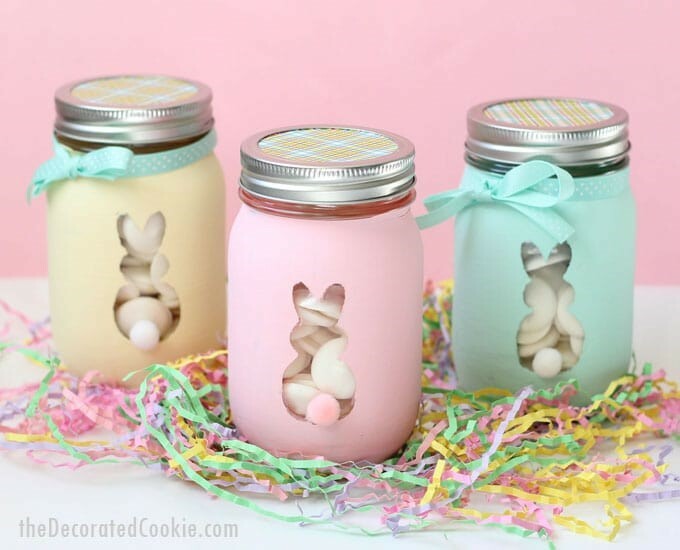 If you’re organising an Easter Egg hunt for your children that involves mini eggs or smaller eggs than those in boxes, creating treat jars for these to be kept in can be a great way to keep everyone occupied while you go off and hide everything! It’s a simple craft, easy for children (and adults) of all ages and requires just some paints, some stencils or stickers, and mason jars. Clean the jars, apply the sticker to the front (or wherever you’d like) and paint the rest of the jar around it. Once the jar is dry, simply peel off the sticker to create a window where you can see all your lovely treats. These cute and kitschy accessories are perfect for both little ones and adults alike to bring in the Easter cheer! All you’ll need are some colourful ribbons, a headband that fits the head of the wearer, some craft wire, glue, and some fake flowers. Create the ears of your rabbit with wire, attaching them to the headband with glue before wrapping the whole thing in ribbon. 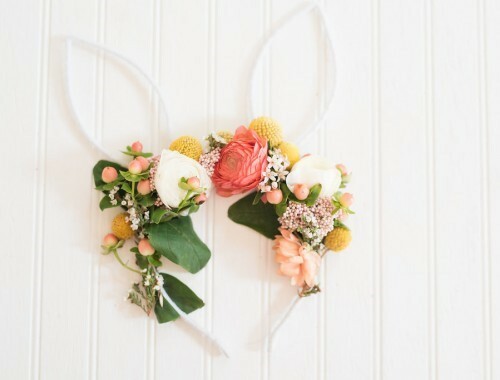 Once done, attach the fake flowers to the headband between the ears and down the sides on the band to create truly cute Easter accessory. Find more inspiration here. Here’s the one you were waiting for- Easter is the best time for edible crafts! 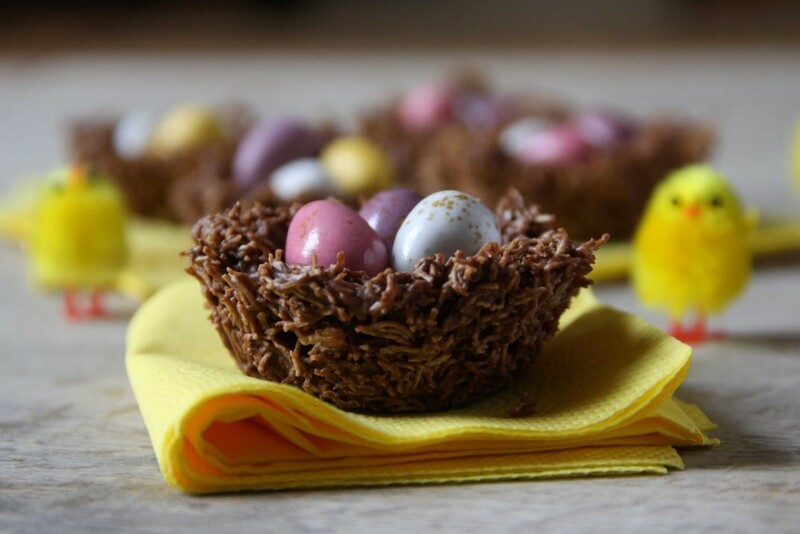 For a fun and easy treat for the kids, why not try out these chocolate Easter nests. With a maximum of three ingredients, these tasty treats are easy to make for any age, and fully customisable. If you’d like to use a different chocolate, such as white or dark instead of milk, there’s no reason why not! Also, if you’re not a fan of shredded wheat, why not use cornflakes or rice crispies instead? The cupcake cases also offer a crafting opportunity where you could buy some fun, Easter patterned ones, make your own to slot over the case the treats are made in, or create a box of some kind to present them. If you’re planning on doing some crafting over the Easter weekend, but don’t want to get your house messy before guests come over on Easter Sunday, why not hire a storage unit to use as a crafting space – no mess in the home and quick clean up! Also, if you make any of the above crafts, or any others, we’d love to see them! Share them with us on Twitter by using @TitanStorage!